When the economy picks up, one group that may come flowing into the work force are mothers who chose to stay home as much due to the lack of jobs as to spend time with their children. For many working women, having children is just a break in their career (though a very tiring and rewarding one). New mothers may take maternity leave from their jobs, or may leave the workforce for a number of years to stay at home. But many plan on going back to work. Of course, many mothers choose to stay home longer to raise their children. And some of these mothers when they attempt to re-enter the workforce , like everyone else nowadays, find there aren’t many jobs out there. In 2010 the percentage of mothers from married-couple families who were employed dropped to 65.4 percent, the lowest point since the U.S. Bureau of Labor Statistics started keeping track in 1994. This is probably due more to the ailing economy than changing social norms. 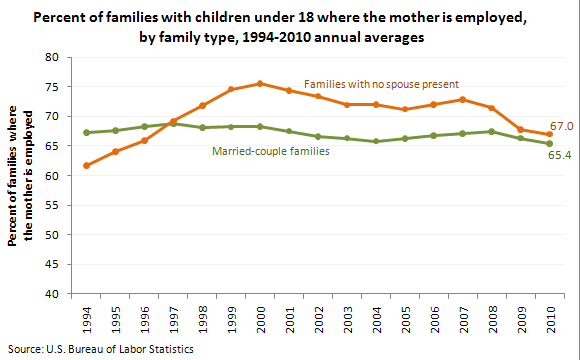 In families with no spouse present, the percentage of single mothers working also dropped in 2010, to 67 percent. That’s the lowest percentage recorded since 1997. Of course, parents with older children are far more likely to be employed than parents with younger children. 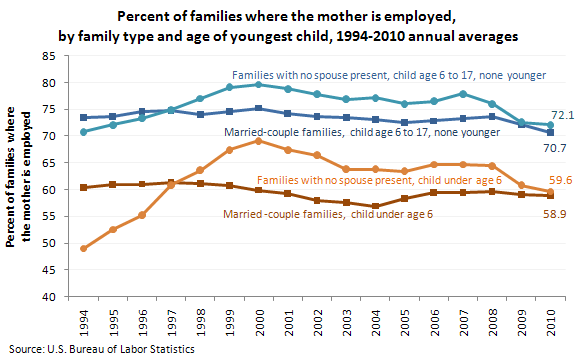 In married-couple families with children ages 6 to 17, the percent of employed mothers in 2010 went up to 70.7 percent. And families with similarly aged children but no spouse present had a slightly higher percentage of employed mothers: 72.1 percent. On the other hand, families with younger children (under 6 years old) had significantly lower percentages of employed mothers. For married couples, the percentage of working mothers was 58.9 percent. For single mothers, it was 59.6 percent. Certainly, some of these mothers have chosen to stay at home. But some of them I’m sure are just waiting for the economy to improve, so that there are more jobs out there. When that happens, and many mothers return to work, it will lead to job creation in one more sector of the economy: day care.